mediAvatar iPhone Ringtone Maker for Mac is the powerful yet easy iPhone ringtone converter Mac software currently available for making iPhone ringtones of your own on Mac! 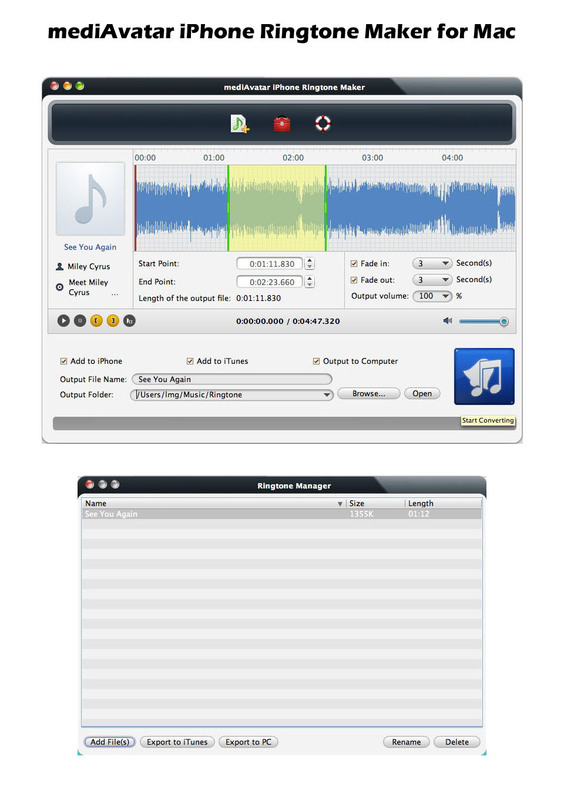 With mediAvatar iPhone Ringtone Maker for Mac, you can trim any music segment and add fading effects to your ringtone and convert it into iPhone M4R ringtone from all audio and video formats such as: AVI, MPEG, WMV, DivX, MP4, H.264/AVC, AVCHD, MKV, RM, MOV, XviD, 3GP, MP3, WMA, WAV, RA, M4A, etc. After iPhone ringtone conversion you can also directly upload the ringtones to your iPhone or iTunes library. mediAvatar iPhone RingTone Maker for Mac is not only the best option to create personalized iPhone ringtones, but also an easy iPhone ringtone manager which can transfer iPhone ringtones between iPhone, Mac and iTunes. 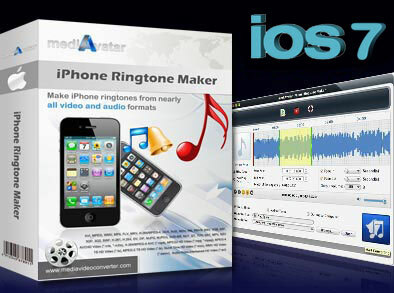 *** mediAvatar iPhone Ringtone Maker for Mac can not convert protected music and video files. Have a trial of mediAvatar iPhone Ringtone Maker Mac now, you'll find making your own iPhone ringtones on Mac couldn't be easier! Extract the music from video formats like AVI, MPEG, WMV, DivX, MP4, H.264/AVC, AVCHD, MKV, RM, MOV, XviD, 3GP, etc. and transform it into iPhone ringtones. Convert most audio formats including WMA, WAV, RA, M4A, AAC, AC3, OGG and MP3 to M4R format as iPhone ringtones. Not only transfer the M4R ringtones to iPhone and iTunes directly after making iPhone ringtones, but also transfer ringtones from Mac to iPhone and backup iPhone ringtones to iTunes or Mac. Two steps are enough to create an iPhone ringtone: 1. drag and drop to add a media file; 2. hit one button to start converting! Add fade-in and fade-out effects to make your iPhone ringtone personalized. Any music segment can be extracted and made into an iPhone ringtone by setting its start and end time (accurate to milliseconds). Check whether the segment to be converted, the fading effects and the ringtone volume are just what you want simply via the built-in music player. Use this iPhone ringtone maker Mac to rename, delete, transfer, backup and manage the ringtone in your iPhone! mediAvatar iPhone Ringtone Maker for Mac is available in English, German, Spanish, Italian and French interface languages.